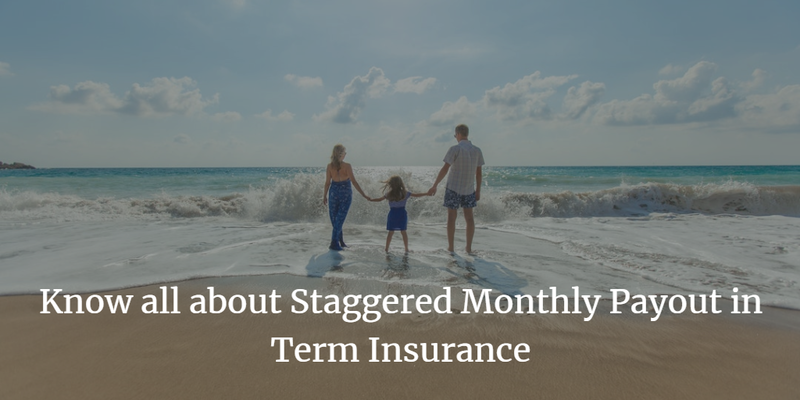 Know all about Staggered Monthly Payout in Term Insurance - Finance Dunia Home Loan | Car Loan | Education Loan | Life Insurance | Car Insurance Etc. Most of the Bollywood films released between 1970s-1990s had one thing in common- father died, and his wife and kids suffered in life. While the father left behind wealth for the family, the villain in the film tried to kill the family to get the wealth. Or, fooled the mother and asked her to sign on the property papers. The mother, who was already in the grief of his husband’s death, signed the papers. Now, the villain had all the wealth and the lady, and her kids struggled to survive. Now, assume what if your family also met with the same fate? Though, you might put your term insurance policy on the table to contradict it, are you sure buying the policy alone would financially secure your family? A few days ago, I was talking about my recently bought term insurance with my wife. Of course, she was first reluctant to discuss it, but when I persisted, she agreed. After listening to me for a while, she asked me a question: “What will I do with this money”? Like my wife, many people have little financial knowledge. Although a term insurance will pay a huge sum of money to your nominee if something unfortunate happens to you, do you think, your family will be able to manage the lump sum amount/one-time payment received on your death? Will your nominee use the amount in a way that all the financial goals you had earlier chalked out are fulfilled? If these questions have made you think even for a minute, it is the time to consider a term insurance offering a staggered payout option. What does staggered payout mean and how is it useful? The death of a loved one is devastating for the family and as a result, the family may not be able to make rational decisions about money which they get from the insurance company. There could be a crowd of greedy financial advisors who may take undue advantage of the situation like it happened in the case of Mrs. Rajni Verma, whose husband Mr. Viren Verma bought a term insurance with regular lump sum payout option. Post his sudden death, his wife Rajni received the insurance amount of Rs 1 crore. Being financially illiterate and at an emotionally unstable phase of her life, Rajni relied on her relatives and friends to decide the fate of the money. However, the money was invested without a thought in some loss making properties and mutual funds. Some relatives also borrowed money and did not return it. It was a complete financial disaster and was too late before Mrs. Rajni realized that the entire money was gone. She was left with no financial assistance to support her eight-year-old son and 11-year-old daughter. Though Mr. Viren had bought a term insurance, his policy failed to support his family financially. It happens to a lot of families and therefore, it is better to opt for a staggered payout option. Under staggered payout, the family gets a portion of insurance benefits on the death of the policyholder, and the remaining is paid-out in the form of recurring monthly income over the tenure of 10-15 years, depending on the insurer. It means the family will get a pre-decided amount every month, similar to the policyholder’s salary. Such plans are useful for a family who will not be able to manage a lump sum amount. Further, term plans with a staggered payout option can also be bought online. Also, from the perspective of tax benefits, both term insurance plans offering staggered and lump sum payouts are treated equally. Irrespective of the payout option chosen, premiums paid on the term insurance are eligible to get an exemption under Section 80C of the Income Tax Act. Unlike an annuity from the pension plan, the monthly income received under term plans is tax-free under Section 10(10D). Should you goodbye lump sum plans completely? Staggered or deferred payouts add customization to term insurance plans, but don’t write off lump sum plans completely. Increasing income is a good option, but it might not suit everyone. People looking for protection against high debts, like home loan, credit card dues, etc. ; might find a regular online term plan offering lump sum benefit a better option, while those looking to secure living expenses and future goals, might be interested in deferred payout and increasing income plans. Also, there could be some immediate needs for which lump sum plans make more sense. If you know your family is financially educated, and you are confident that they can smartly use the money or are at a key life stage like education or marriage, then you should opt for lump sum payouts. According to the survey conducted by one of the Indian insurance companies, 62% respondents said that financial protection is complete only if the policy gives lump-sum death benefit along with the regular income to meet daily household expenses. Therefore, for the adequate coverage, you should opt for a term insurance plan that combines lump sum and monthly payment option. For instance, ICICI Pru iProtect Smart, an online term plan, gives three different ways to receive death benefits: Lump sum, Income and Increasing Income. At any time, a beneficiary can convert all or some of the monthly income into lump sum. No one knows your family better than you, and so you are the best to decide their fate. Whatever the mode of payment you choose, make sure the insurance coverage is adequate. Hi shrikant, last month I opened new Rd account however Rd installment didn't deducted automatically. I opened the Rd account on 3 Jan 2017 and next installment should be deducted on 3 Feb 2017. Also I am not confirm that I set standing instruction or not. Please let me know how I can set the standing instruction now so that amount hets automatically deducted. Please follow the sequence as First open onlinesbi.com and then after login click on Payments/Transfers > Funds Transfer (Own A/C) you have to select your RD account and on Payment Option select Standing Instruction. So it will be a fund transfer transaction type. It will count in erd or not because if it automatically deduct the transaction type shows as erd. I can't get your point.Please clarify in detail. Staggered payout actually would solve a lot of problems.